Summary: ENHANCED chance of strong to severe storms with damaging wind and large hail the main threats. Triple-digit heat indexes also still holding strong. As the event gets closer to us, we will be nowcasting on our Twitter @HickmanSevereWx and updating this post as more information becomes available and is warranted. New updated will be posted right below this text and above the original post. HOT and humid today with a feels like temperature of 104 (actual temperature should reach about 92 degrees if you don’t get rained on). Take it easy outdoors, stay hydrated, never leave kids and pets in a hot car. 60% chance of rain, mainly after 1pm today. We are in the ENHANCED category for severe weather (3 on a 0 to 5 scale) until 7am Wednesday. There is a 30% chance of seeing damaging winds 55+mph and hail greater than 1 inch (quarter size) in diameter within 25 miles of a point. In particular, there is a 10% or greater chance of seeing hail 2 inches (hen egg size) in diameter or greater within 25 miles of a point. There’s also a 2-5% chance of seeing a tornado within 25 miles of a point. Two rounds of storms coming – one about 2-5pm and another just after midnight. Damaging winds, large destructive hail, and an isolated tornado is possible. Report any wind damage, hail compared to the size of a coin, flash flooding, or anything that may look like a tornado to us on Twitter @HickmanSevereWx and using hashtag #tspotter. Read here for info about reporting severe weather. Here we are again with a two-fold hazardous weather day. We are still dealing with triple-digit heat indexes for today and our chance for severe weather has been increased to the ENHANCED category. So let’s outline the details. Today, expect partly sunny skies with a 20% chance of thunderstorms starting out, increasing to 60% chance this afternoon. Our high temperature will climb to 92, and with humidity factored in it is going to feel a lot like 104 degrees. Winds will be breeze coming from the west southwest at 10 mph. If it hasn’t rained in your area, the heat index will be a sultry 104 degrees. This is what it will feel like when you step outside, even though the high temperature will be around 92. The fact that there is a 12 degree difference between the forecasted high and the forecasted heat index tells you our atmosphere is extremely humid (which is why we have a chance for severe storms today). Be sure to take it easy if you work outside. Don’t leave pets or children in a car AT ALL for any length of time. Stay hydrated and take frequent breaks. Also, try to avoid the noon to 3pm time frame outside. The SPC has upgraded our severe weather possibilities from yesterday and put us just inside the ENHANCED category for severe weather today. On a scale from 0-5, this puts us at a 3. With this ENHANCED category severe weather comes with not-so-comforting percentages of what kinds of severe weather we will get. Here’s SPC’s outlook for damaging wind 55+mph or greater within 25 miles of a point. It has us firmly in the 30% chance (red). Next, they have placed us in the 30% chance of seeing damaging hail 1 inch (quarter size) or greater in diameter within 25 miles of a point (red). The county is also split with the hatched area which means there is a 10% or greater chance we will see hail 2 inches (hen egg size) in diameter or greater. 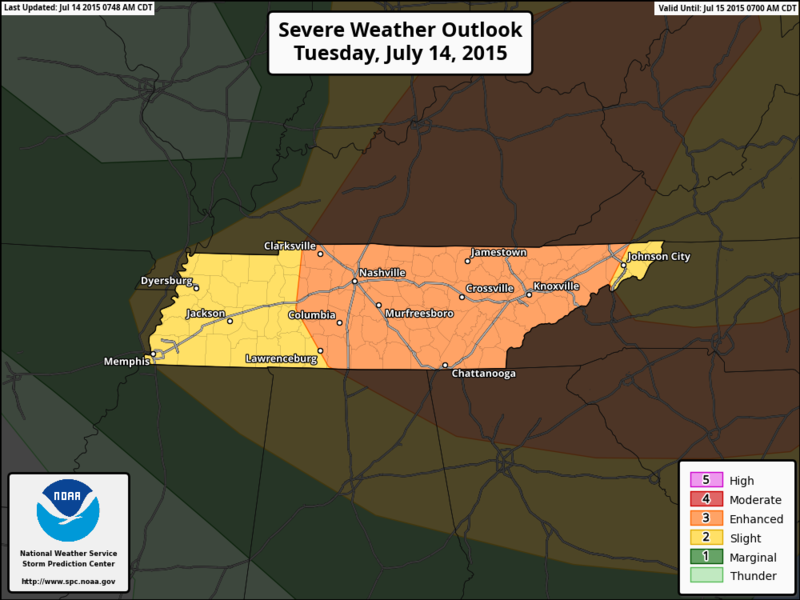 The SPC also has Hickman County split between a 2% and a 5% chance of seeing a tornado within 25 miles of a point. IMPORTANT: Just because the SPC draws these lines and puts percentages on them doesn’t mean the storms will stay perfectly inside these lines. Also, the SPC updates Day 1 outlooks several times a day, so we will post updates on Twitter and here as it is warranted. Right now the models believe we will see two rounds of storms. First, there will be popup storms in the afternoon, followed by a break, then more storms after dark. Let’s jump into the models. First, we will start with the HRRR, as it is updated hourly and is a short range model. Below is the HRRR loop which starts at 8am today and goes through 10pm tonight. This model shows storms popping at around 2pm right on top of us and moving south of us. 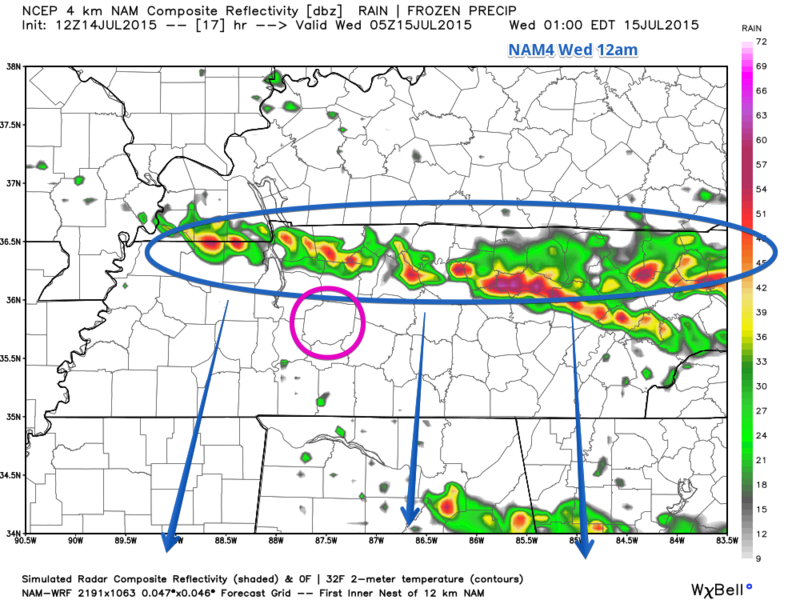 Here’s a still of HRRR’s simulated radar for 2pm (Hickman County circled in pink). 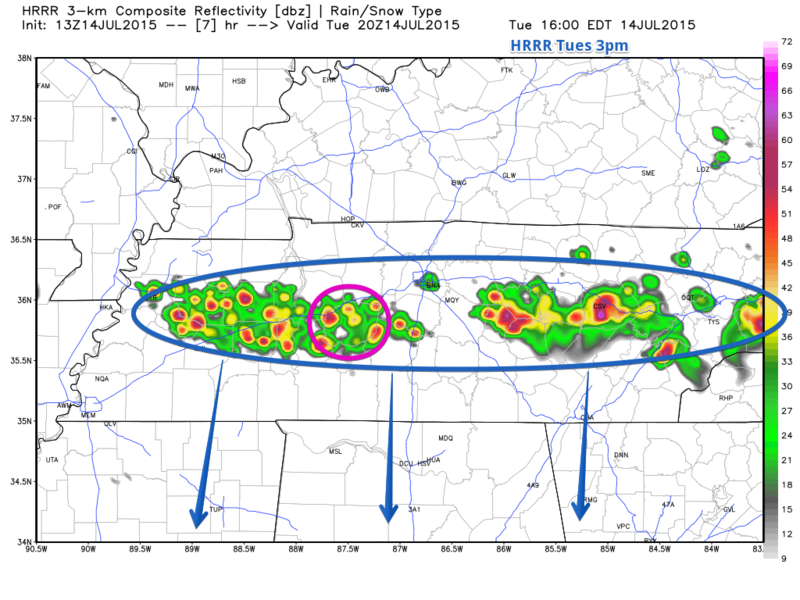 HRRR shows the storms really intensifying at 3pm as show below (Hickman County circled in pink). NAM4 still doesn’t show much at 3pm. 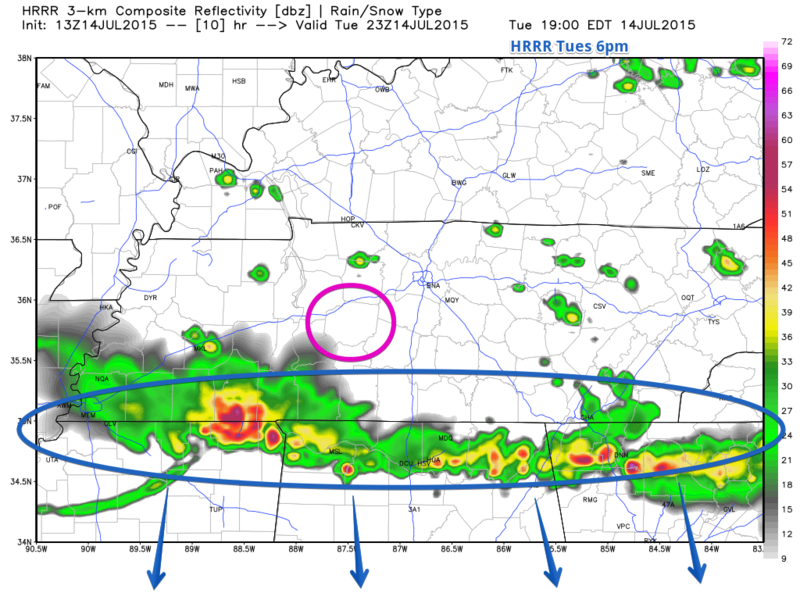 At 6pm HRRR believes the first round of storms will have already moved south of us (Hickman County circled in pink). The NAM4 simulated radar model believes the storms will pop just a bit later and a bit more south than HRRR model outlined above. 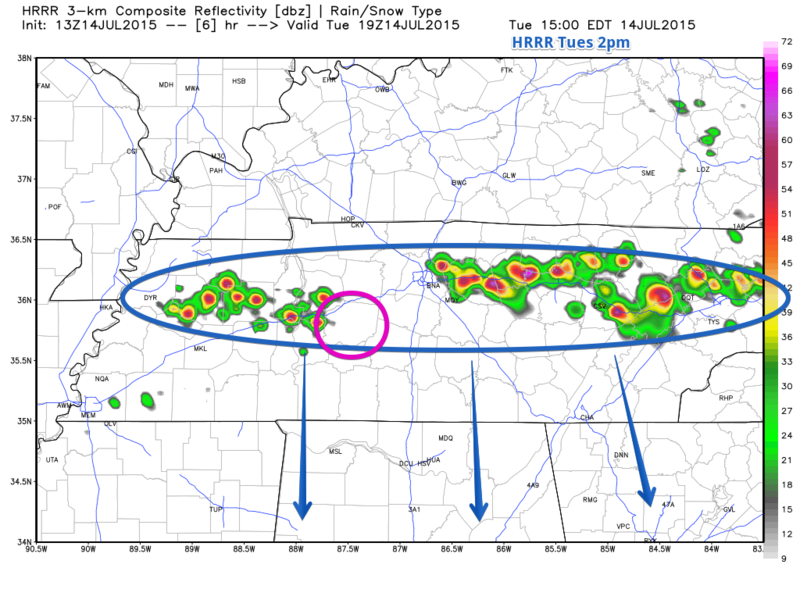 It shows storms popping at about 6pm as shown below (Hickman County circled in pink). It also shows the storms not as strong either. 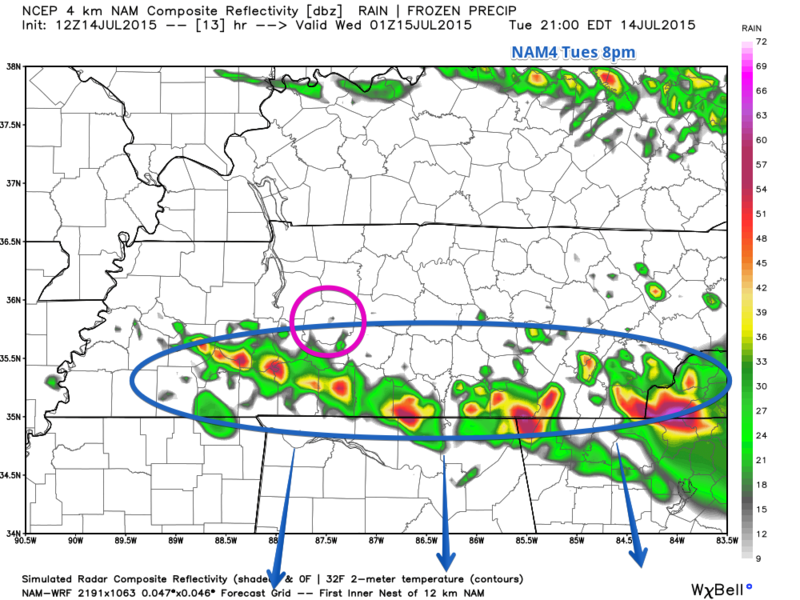 NAM4 then shows the storms intensifying as they move south of us. 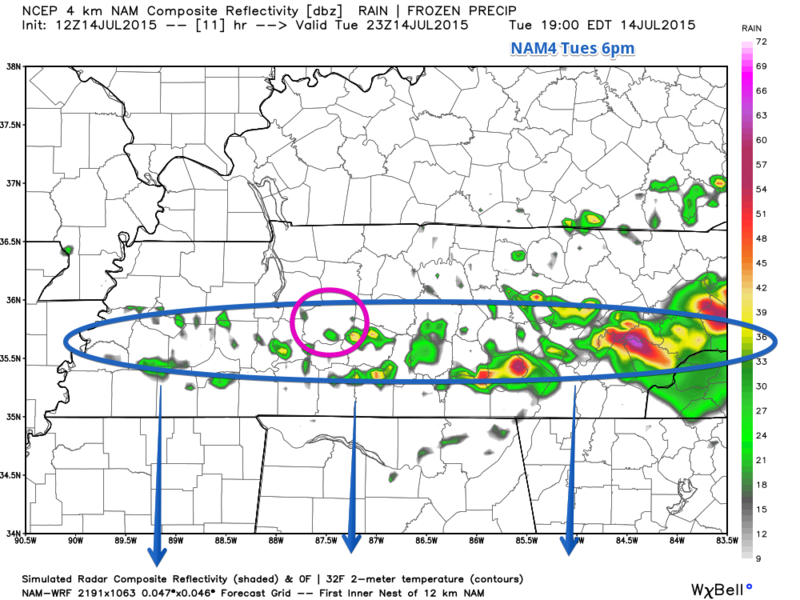 Here’s NAM4’s simulated radar at 8pm (Hickman County circled in pink). While the HRRR is currently out of range after 10pm tonight, NAM4 (a midrange model updated four times a day) shows a second line of storms coming close around midnight. 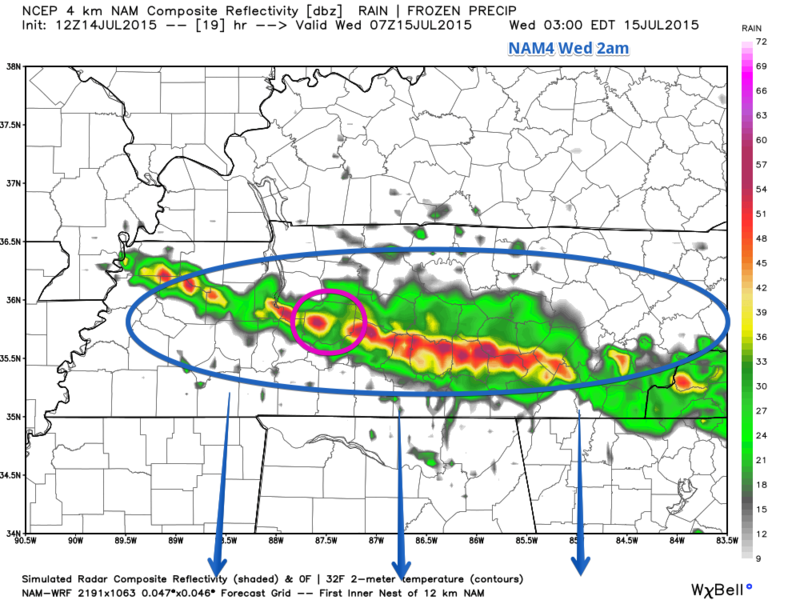 Here’s the NAM4 simulated radar at 1am Wednesday morning, showing the storms becoming more of a line. 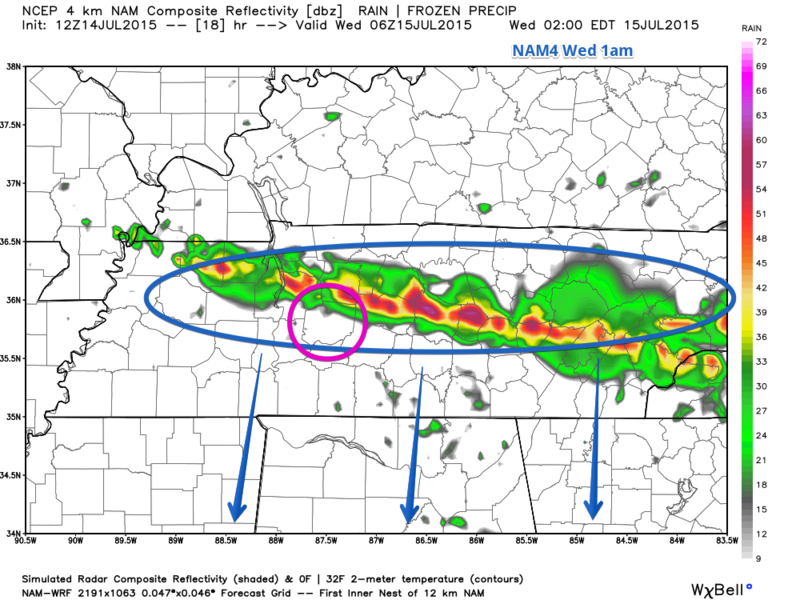 NAM4 shows this line of storms waking us all up at 2am. Finally, the storms will push south and be out of our hair by daybreak Wednesday morning. 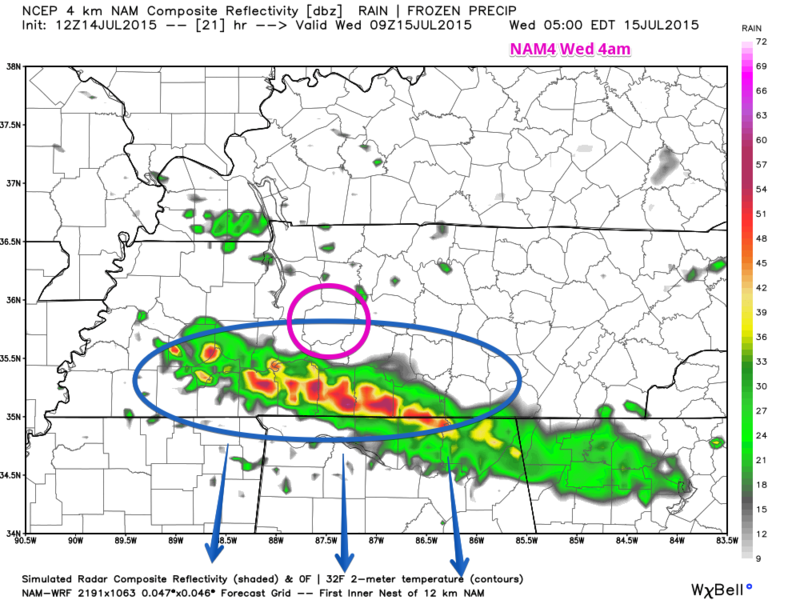 Here’s NAM4’s simulated radar for 4am Wednesday. Stay weather aware and pay attention to the radar and TV meteorologists as the storms start getting closer. We are NOT meteorologists. We are simply educated translators. Pay attention to several different sources of weather. If you see any severe weather or damage resulting, including trees down, hail, or a possible tornado, please let us know using #tspotter on Twitter. We send this info to NWSNashville so they can adequately issue warnings. Read more about how to report severe weather and what to look for by reading here.